With all the tang and flavor of a traditional cheesecake, this Cookies and Cream Cheesecake is lower in fat so you can eat more! Yup! You guessed it! It’s that time again. It’s time for Camilla’s anniversary! You know, Camilla right? Of Culinary Adventures with Camilla? Oh my word. Y’all are missing out if you do not know Camilla. She’s only like, one of the bestest bloggers ever and puts together these amazing events that are a blast to participate in. Let’s see, there was #TripleSBites, #HotSummerEats, #FreshTastyValentines, #10DaysofTailgate, and then last year’s #FifteenCheesecakes. When she sends an email asking if I want to participate, you can BET I’ll be signing up. Not only are there a ton of really cool bloggers, but it’s really great exposure on all those different blogs and I usually wind up with some new followers afterwards. But that’s not the reason I participate. Camilla is super sweet and everyone is supportive and helpful in these events. It’s like a mini community of just awesomeness! Okay. I have a sordid past with this cheesecake. You see, this is round two with this cheesecake. I tried it over the holidays for dessert and it was a total #fail. Like, had to throw half of it out fail. It was horrible. Not the flavor, but the texture. I overcooked it. So, I cannot stress enough to please trust my judgement and follow the cooking directions. I don’t have many cheesecakes on my blog. There was that whole round of the low fat ones using cottage cheese, yogurt, and cream cheese. I think the peanut butter one was probably, hands down, one of my ultimate favorites that I’ve made so far. Though, that blackberry one was a pretty close second, for me at least. Did you know that cheesecake doesn’t always have to be sweet? I didn’t know that either. I made one that was a savory pesto cheesecake for an appetizer once. It was SO GOOD! So good that Mom decided to try it and take it to a dinner with her hubs and some friends. She thought it was fabulous. So, think outside the box! Can you imagine a creamy, sun-dried tomato cheesecake? Or even a Kalamata olive or tapenade style one? Oh yeah baby. But this, this cheesecake is a sweet one. And it’s pretty darned good, if I don’t say so myself!! It’s packed with delicious cookies and cream flavor. I mean, you can see all those flecks of cookie bits, right?? Then it has that cream cheese tanginess that pairs well with chocolate cookie crust. It’s packing some serious cheesecake flavor. Sometimes I serve it drizzled with chocolate sauce and sometimes I don’t. Sometimes I put a cookie on top and sometimes I don’t. Serve this up any way you like!! Now, I will admit that mine cooked a little longer than I should have let it cook. I’ve adjusted the times in my directions so you do not do this. There’s quite a bit of carry over cooking heat that goes on after it’s removed. I don’t want y’all to have a dry cheesecake, so make sure it’s pretty wiggly when you remove it. My pan is 9 inches round and there was about 2 1/2 inches of non-jiggly cheesecake around the edge when I took mine out. Make sure you take yours out between 2 to 2 1/2 inches of jiggle. Yes, these ARE technical terms! If you take it out farther than that, it’s going to be dry. The first one? Well, let’s just say there was about3 inches of jiggle or more. So, yeah. It was almost like eating glue paste. Not from a bottle glue but that kind that comes in a little jar with an applicator brush attached? Yup. That kind of paste. Please, respect the cheesecake and DO NOT do this. You will doubt me. You will doubt yourself, but do not doubt the power of carry over cooking. How do you celebrate your anniversary? And with what kind of cheesecake? Line the bottom of a springform pan with aluminum foil and assemble the pan. Lightly spray with cooking spray and set aside. Place the graham crackers in the bowl a food process and process until fine. Drizzle the butter spray from the chute while pulsing the cracker crumbs until the crackers turn dark brown and start to come together. Pour the crumb mixture into the bottom of the springform pan and carefully press into the bottom and about an inch up the sides of the pan. (I use the bottom of a glass covered in plastic wrap to get a nice, clean edge around the bottom and sides of the pan.) Set aside. Add the cream cheese, sugar and vanilla to the bowl of a food processor and process until smooth. Add eggs yolks and process until combined. Pour into a large mixing bowl. Stir in the cookie crumbs and set aside. Place the egg whites in the bowl of a stand mixer and beat until stiff peaks forms. Fold 1/4 of the egg whites into the cheesecake mixture. Fold in remaining egg whites until combined. Carefully pour the batter into the crust. Bake 40 to 50 minutes or until center is still jiggly about 2 inches from the sides of the pan. It will continue to cook after removing from the oven. Run a sharp knife around the edge of the pan and cool in the pan at least one hour before refrigerating at least 3 hours or overnight. Slice and serve with cookie garnishes. You didn’t mention your chocolate sandwich cookie crumbs in the instructions. When do you put them in your preparation? So I did! Thank you for bringing that to my attention. They should be stirred in before the egg whites are folded in. Thank you, Michaela! You’re more than welcome to stop by and grab a slice. Just looking at the pictures makes my mouth water. Cookies and Cream, perfect combo. You can never go wrong with cookies and cream! What a picture-perfect mouth watering slice! Cheesecake is all about getting the jiggle right. I’m always afraid I’ve underbaked it, and a dry one just isn’t as good. This looks so yummy! Hubs would love it. Thank you, Sarah. Yup! It’s all about the jiggle. Beautiful photos! Love this recipe, two of my favorites … cookies and cream! Thank you, Julie! They’re also my husband’s fave pairing for dessert, too. Sorry your first cheesecake failed! I seem to have cheesecakes fail more than anything else I cook. Your second attempt looks amazing! Thanks, Tara! It is much better. The creamcheese variety is a little less forgiving than my previously recipes. It’s all in the jiggle! Cookies and Cream!!!!! Oh my goodness, what a great combination! Thank you, Amy! It is mighty tasty. I couldn’t agree more, Christie you gotta go with the jiggle! Great flavors going on in the cheescake! Thank you, Cindy!! That’s the best way to tell for cheesecakes. 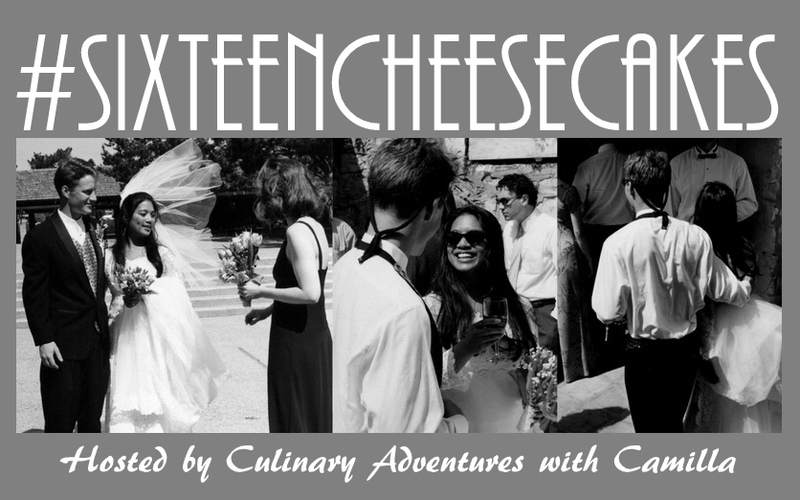 Thanks, Christie…for the super kind words but, especially, for joining my #SixteenCheesecakes party. I can’t wait to try your cheesecake! I love this (almost) guilt free version. Thank you, Wendy! It is so good… You won’t miss those extra calories.